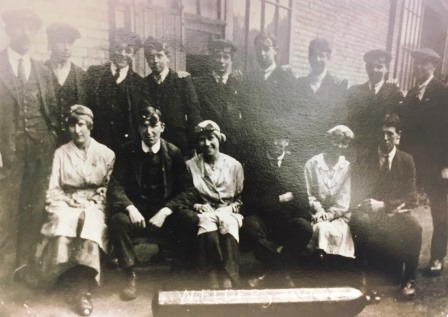 Tuesday 29th May 1917: The munitions workers of Luton have worked through the Whitsuntide Bank Holiday weekend to make up some of the time lost due to their recent strike action. The strike had disrupted munitions work across the country until the arrest of seven strike leaders triggered the Prime Minister’s intervention and an agreement that there should be a return to work with no victimisation, and that formal negotiations should take place between the Executive Committee of the Amalgamated Society of Engineers and the Government. The Luton men returned to work last Monday following a unanimous vote. Saturday 26th May 1917: The Win-the-War Exhibition held this week at Leighton Buzzard Institute has been a great success, as housewives flocked to the Institute to discover new ways to economise on food. Miss Cobon of the cookery school gave lectures on war time cookery twice daily to large audiences, with accompanying demonstrations – hay box cookery was of particular interest. Two large rooms were filled with a collection of food substitutes, all labelled and with recipes attached to the cakes. The Council Chamber held the work of elementary school children. Boys from Beaudesert showed examples of the bed rests and splints they have been making for the war depot. The also exhibited a collection of coal, wood and match substitutes, with novelties including the use of dried potato peelings as fire-lighters. Girls from the cookery school demonstrated bread substitutes, including rice bread, oat cakes, sugarless maize pudding, eggless cakes, and oatmeal biscuits. In the second room Miss Draper of the High School showed eighteen varieties of vegetables which could be used instead of potatoes. These were mostly grown in her own garden and included the rarely used but excellent root salsify. There were also mixtures of potatoes and parsnips, potatoes and rice, and so on. Pupils from the High School had a stall of wartime dishes, puddings and cakes, decorated with carnations from Ascott. Another large stall featured economical cakes made by a group of ladies using only a small amount of flour and sugar, including a date cake which used neither. Carefully weighed and measured daily and weekly rations were on display, and hints and methods for preserving and bottling fruit were provided. Mr. Herbert Turney of the Vandyke Road bakery also exhibited bread and cakes made from flour substitutes. Thursday 24th May 1917: Kempston marked Empire Day in a more unusual way this year. Rather than the customary morning celebration at schools, followed by a half-day holiday, celebrations involved the whole town over the course of the day. 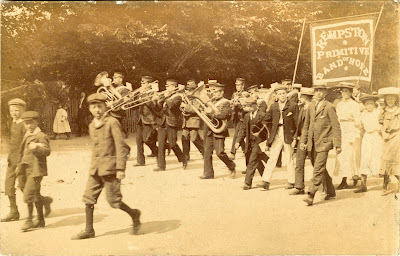 A parade involving approximately 900 children took place through the main streets of Kempston, led by the Boy Scouts Band. Most of the girls were in white and nearly every child had a flag. Many carried coloured posters encouraging food savings. Following the march, a gathering took place in Bedford Road school grounds, the children in front and the parents behind. The children sacrificed their usual half-day holiday to attend the ceremony. A Royal Proclamation on food saving was read out and parents were encouraged to sign a pledge to economise. The boys were then called upon to salute the flag and cheers rang out for the Royal Family, the Empire and soldiers and sailors. The gathering was then asked to salute the dead. There were many women in the audience who had lost husbands and sons and who had tears in their eyes. The boys and girls were told by one of the chairs, Mr Carruthers, that they were the most important audience members because they were the men and women of days to come, who would inherit the Empire. He reiterated that those at home could do a great deal to bring about the end of the war by economising on food – if the people of Kempston could leave the table a little bit hungry they would be the better in health for it. Not to appear hypocritical, Mr Carruthers declared that he himself was eating a third less than he used to do and did not think he looked the worse for it! The day was deemed a great credit to the War Savings’ Association, schools, and the urban & parish councils. 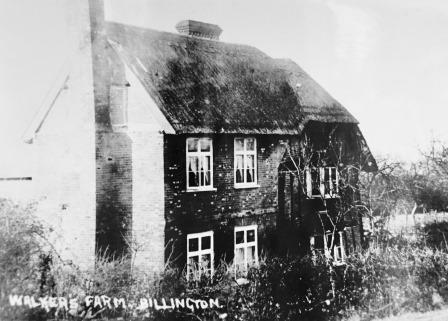 Tuesday 22nd May 1917: The family of nurse Edith Halford of Leighton Buzzard have been surprised by her unexpected return after she left for service in one of the more distant theatres of war. She never reached her destination, having had a narrow escape when the ship on which she was travelling was sunk. She and other nurses on board spent four hours in open boats before they were picked up by a tug. Miss Halford and her sister were enthusiastic members of the local Voluntary Aid Detachment before the war. For the past two years she has been nursing in an Army Hospital at Cambridge, where she and 56 other nurses were recently selected for foreign service. She is in good spirits and hopes she will be able to return to useful hospital work. Miss Halford’s father Edwin, one of the town’s oldest tradesmen, runs a jewellery business at 22 Market Square. Private Allen is now making satisfactory progress in hospital, although the matron says it will be some time before he will be able to sit up. Thursday 17th May 1917: Food shortages caused by German submarine blockades have made it urgently necessary for British farmers to produce more corn for bread production. Farmers across the county have been told by the Bedfordshire War Agricultural Committee that three million acres of grass land will need to be broken up and sown with corn for the 1918 harvest, of which 30,000 acres must come from Bedfordshire. A further 47,000 acres will be needed from Buckinghamshire. A survey is to be carried out to divide the land into three categories: land to be broken up immediately; land to be broken up shortly; and land which may be broken up at a later date. It was necessary to keep up the milk supply, but the numbers of other cattle must be reduced as grazing land is now required for corn production. Targets have been given to each Petty Session division: Leighton Buzzard is to plough up 1,000 acres, Linslade 4,250 acres, Woburn 3,250 acres and Ampthill 4,375 acres. Source: Leighton Buzzard Observer, 8th, 15th and 22nd May 1917. Tuesday 15th May 1917: The musicians attached to the National Institute for the Blind received a hearty welcome this afternoon at the Corn Exchange. The concert was given in aid of St Dunstan’s Hostel (Regent’s Park) for blinded soldiers and sailors. The concert included an organ recital, a chamber recital, a violin and piano recital and the musical gifts and sensitivities of the players were impressive. Half-way through the programme, an address was given on the work of St Dunstan’s, which included training so that blinded veterans can supplement their 25s per week pension. Over 600 soldiers had learnt new skills, including type-writing and short-hand. The concert realised around £100 and Bedford Recreation Committee were thanked for allowing it to go ahead. Highlights of the concert included Schubert’s ‘Who is Sylvia?’ played by the quartet as well as the concert finale ‘Our Empire in Arms’ (arranged by Collard). 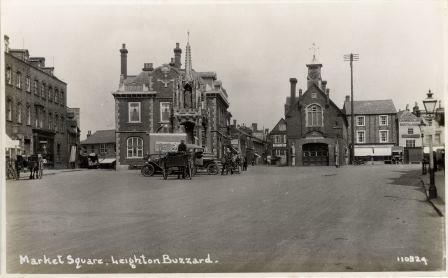 Sunday 13th May 1917: A concert was held last night at the Corn Exchange in Leighton Buzzard to celebrate the delivery of the first bus made at the Morgan and Company Limited works in Linslade. A toast was proposed to the company by the Chairman of Linslade Urban District Council, who recalled his friendship with Mr. William King, the proprietor of the works before Morgan’s arrived in the town forty years ago. He believed Morgan and Company had manufactured every kind of wheeled vehicle from the popular Battlesden car to the 30 to 40 horse-power motor with luxurious landau-lette and limousine bodies. He was sure that the company had a great future before it. He recalled when Morgan’s employed 50 or 60 hands, compared to the 400 who now worked there. These include 100 women and girls who can be seen carpentering, filing drilling, and even welding. The concert was presided over by Mr. R. A. Wheatley, who has recently come into the works and carried out a reorganisation. A former professional singer, he was one of the most popular contributors to the concert programme. He also gave a speech in which he told the audience that he had visited Farnborough and seen the bus, and had been complimented on it by “one of the sternest critics” who said it was the finest first bus every delivered to him. He intended to ensure that good relations between the company and its workers continued, and would be putting the employees on a bonus system which would recompense them for really good work. The part of the work-women in this war was “simply glorious”, and when the last nail was driven into the coffin of “His Nibs” the women of England would have played no small part in the victory. 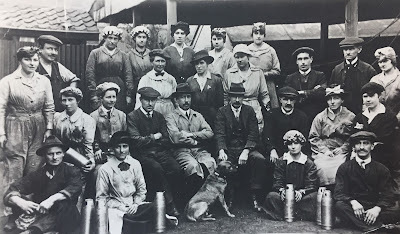 The company’s “top hole” ladies had worked until three o’clock in the morning so that the first bus could be delivered within 24 hours of the time it was promised. The company chairman, Mr. J. W. Salisbury was not able to attend, but wrote congratulating the entire staff on the progress of the work now in hand. 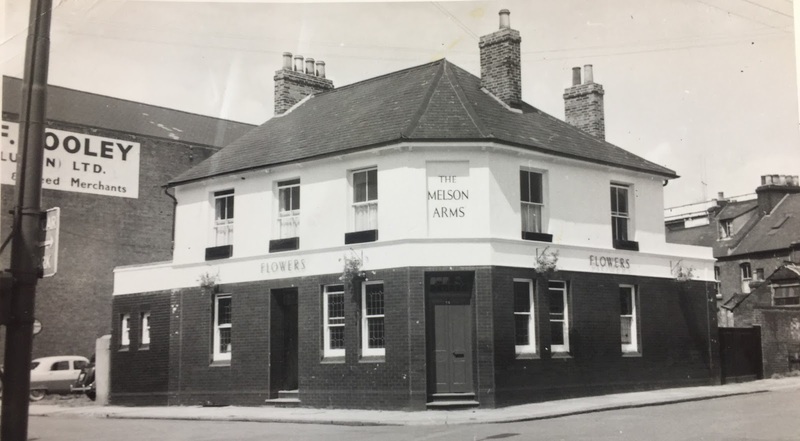 Saturday 12th May 1917: On April 12th Mr. William Gray, a fishmonger of Castle Street in Luton, received news that his son, Private Sydney Gray of the Essex Regiment had been wounded in Egypt. Further news followed including a letter from his son in which he said he was doing very well, but on May 4th Mr. Gray received official notification of his son’s death, with a message of sympathy from the King. Confused by this turn of events, Mr. Gray cabled the hospital and is relieved to have received a reply stating “Error. Doing well.” Before the war Private Gray worked in his father’s business and was well known in Luton as an excellent swimmer and sports enthusiast. He joined up last year and sailed for Egypt after training at Halton Camp. Another Luton resident, Mrs.Fanny Lake of Ash Road, has been informed that her husband, Private Harold Alfred Lake of the Bedfordshire Regiment is missing and presumed to be a prisoner of war. His commanding officer wrote “I am very sorry to inform you that your husband, who went into action on April 23rd is missing. From inquiries I have made I can gather no further details, but think most likely he is a prisoner of war. Should he be a prisoner I should not worry too much, as he will not have a bad time.”  Private Lake joined up on 2nd September last year and went to France just before Christmas. He previously worked at the Diamond Foundry and was a member of Bury Park Brotherhood and football club. Sadly this was a mistaken hope. Harold Alfred Lake had in fact been killed on 27th April 1917. 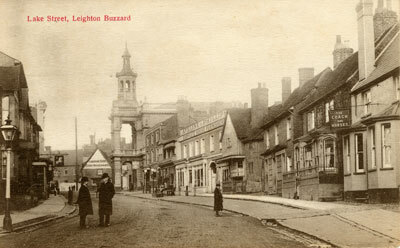 Thursday 10th May 1917: Fundraising events have been taking place in Leighton Buzzard today to raise money for the work of the Leighton Buzzard War Hospital Supply Depot. Two concerts and a dance have been held at the Corn Exchange in Lake Street. The most unusual part of the programme was a sale of fashionable and model hats, including a number of “creations” presented by local well wishers. Many of the hats were bought for high prices then returned to be raffled, making this a very profitable enterprise. 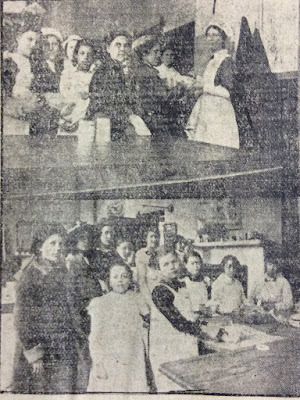 Extra funds were raised by a flower stall in the vestibule arranged by Mrs. Garside and by a refreshment stall run by Mrs. Phillips helped by a number of depot workers. Highlights of the concerts were performances by Captain H. H. Cobb, a specialist in coster impersonations; a party of Pierrots known as “The Frolics”; and Mr. W. V. Robinson, a Canadian entertainer popular in the London Halls, who played the mouth organ . The evening’s dancing was accompanied by a military orchestra from Bletchley. Since opening in March last year the Leighton Buzzard War Hospital Depot has sent to British and allied hospitals over 20,625 items, including garments, dressings and bandages. Saturday 5th May 1917: Two Luton men are now believed to have died when the SS Arcadian was torpedoed and sunk while carrying troops from Salonika to Alexandria. Little hope is left for Private Cyril Scoats of 70 Burr Street, and Private Stanley Glenister of Adelaide Terrace. The parents of both young men have received telegrams from Aldershot stating that they are believed drowned. Both were just twenty-one years old and were serving with the Royal Army Medical Corps. 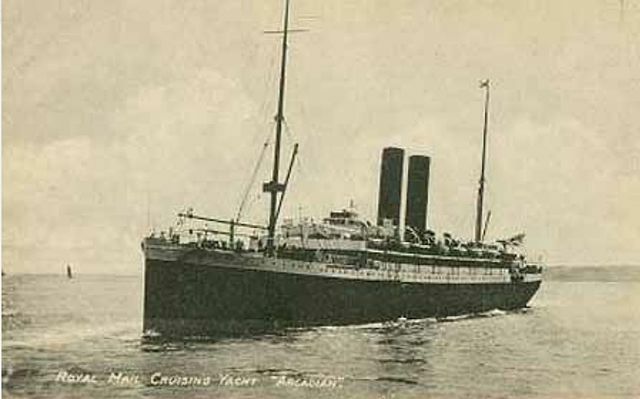 The Arcadian sank within six minutes of being hit with the loss of 279 lives. Wednesday 2nd May 1917: The first public meeting of the Bedford Boy Scouts took place at the Town Hall, under the chairmanship of the Mayor. 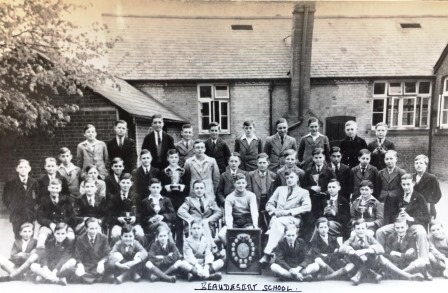 There was a large attendance in the Hall, including a gathering of Bedford headmasters. The meeting was called in order to revive interest in the movement, in the hope that it would result in a considerable increase in Boy Scouts. The proceedings commenced with the singing of the National Anthem and the saluting of the flag. The Mayor then spoke about the benefits of the Scout movement in training the young to be good citizens and in instilling discipline. The Scouts had done much good work so far, helping to promote war entertainment and also helping to collect thousands of eggs for the benefit of wounded soldiers. An inspection of the Scouts by Lord St John then took place. He addressed the boys, stating that it was not his duty to praise the Scouts but to find fault. However, the Scouts had so improved that it was difficult for him to find any fault. The Scouts still had much to do and it was their chief duty to do good for someone else every day, even if it was just by smiling. 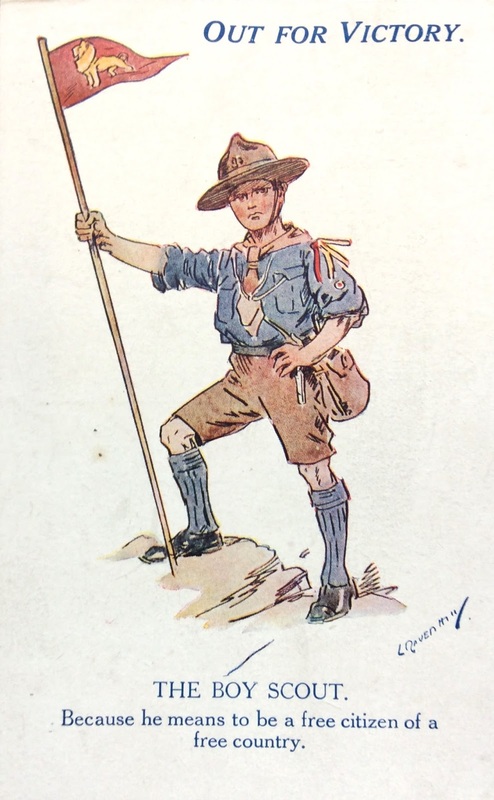 It was reported that there were roughly 20,000 Boy Scouts in the Army and the training they had previously received stood them in good stead. 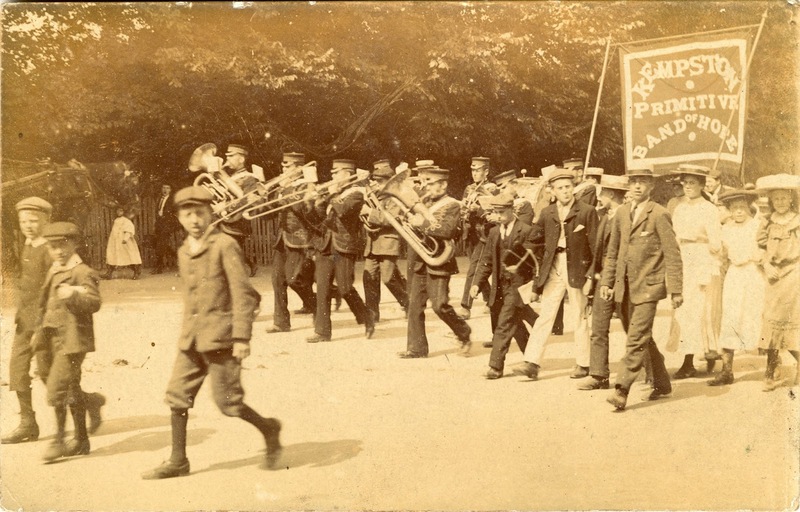 Parents were encouraged to support their sons by turning up to church parades. During the evening, songs, recitations, ambulance displays and an exhibition on the parallel bars were given by members of the different troops.